Ursula K. Le Guin is a highly prolific and popular writer with 21 novels, 11 collections of short stories, a dozen children’s books, and other volumes of essays and poetry. She has won most of the country’s top literary prizes. She lives in Portland, Oregon with her husband, and has three children and four grandchildren. She says about her life: “I love living almost as well as I love writing.” Ursula K. Le Guin is very involved with Portland’s writing community and is a progressive political activist. Please enter your email address and click the Follow button to follow Ursula K. Le Guin! 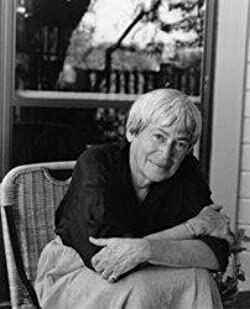 The recipient of numerous literary prizes, including the National Book Award, the Kafka Award, and the Pushcart Prize, Ursula K. Le Guin is renowned for her spare, elegant prose, rich characterization, and diverse worlds. "The Field of Vision" is a short story originally published in the collection The Wind's Twelve Quarters . Owen is seventeen and smart. He knows what he wants to do with his life. But then he meets Natalie and he realizes he doesn't know anything much at all. A slender, realistic story of a young man's coming of age, Very Far Away from Anywhere Else is one of the most inspiring novels Ursula K. Le Guin has ever published.